Brett Williams rescued a point for Forest Green Rovers in the National League with a late goal at Wrexham. Darren Carter put the visitors ahead but Blaine Hudson struck twice after the break to put the hosts on the brink of victory. But in a dramatic end, Rovers' Sam Wedgbury was sent off for a second yellow card before Williams levelled. 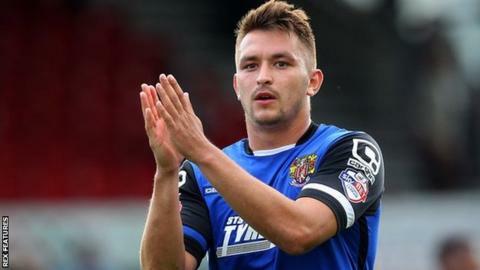 Wrexham remain 12th while the end of Rovers' six-match winning streak saw them drop to second behind Cheltenham. Wrexham manager Gary Mills told BBC Radio Wales: "We've had a couple of cruel, cruel Saturdays - last minute things. A penalty last week and a late equaliser today is tough on us. "And it's just those thin dividing lines making the difference of whether you achieve what you want to achieve. "And we could be four points better off than we are, but we're not. "What can I say after what my players have given me today - unbelievable - and I'm absolutely delighted with them." "It's a point won - when you go down to ten-men and you've only got another minute to go, it's a point gained. "I'm just disappointed with the two goals. The build-up and the free-kick - it's all our own fault, we were a bit naïve I thought on both of the goals. "We should have been a little bit more ruthless in front of goal in the first half, we played some lovely football in the conditions. "But I'm really pleased, this is a big club, we knew it was going to be a tough place to come and it ticks the board over with another point for us." Match ends, Wrexham 2, Forest Green Rovers 2. Second Half ends, Wrexham 2, Forest Green Rovers 2. Foul by Blaine Hudson (Wrexham). Charlie Clough (Forest Green Rovers) wins a free kick. Goal! Wrexham 2, Forest Green Rovers 2. Brett Williams (Forest Green Rovers) right footed shot from outside the box to the bottom left corner. Assisted by Kurtis Guthrie with a cross. Second yellow card to Sam Wedgbury (Forest Green Rovers) for a bad foul. Foul by Sam Wedgbury (Forest Green Rovers). Simon Heslop (Wrexham) wins a free kick. Foul by James Jennings (Forest Green Rovers). Connor Jennings (Wrexham) wins a free kick. Foul by Kayden Jackson (Wrexham). Offside, Wrexham. Kayden Jackson tries a through ball, but Kayden Jackson is caught offside. Foul by Sean Newton (Wrexham). Kurtis Guthrie (Forest Green Rovers) wins a free kick. Attempt missed. Kayden Jackson (Wrexham) right footed shot from outside the box. Foul by Brett Williams (Forest Green Rovers). Mark Carrington (Wrexham) wins a free kick. Substitution, Forest Green Rovers. Brett Williams replaces Darren Carter. Attempt saved. Blaine Hudson (Wrexham) header from the centre of the box is saved. Assisted by Mark Carrington. Simon Heslop (Wrexham) is shown the yellow card for a bad foul. Sam Wedgbury (Forest Green Rovers) is shown the yellow card for a bad foul. Adriano Moke (Wrexham) wins a free kick. Substitution, Forest Green Rovers. Kurtis Guthrie replaces Keanu Marsh-Brown. Substitution, Forest Green Rovers. Kieffer Moore replaces Jon Parkin. Goal! Wrexham 2, Forest Green Rovers 1. Blaine Hudson (Wrexham) left footed shot from a difficult angle on the left to the centre of the goal. Assisted by Connor Jennings with a headed pass. Foul by Aarran Racine (Forest Green Rovers). Kayden Jackson (Wrexham) wins a free kick. Foul by Adriano Moke (Wrexham). Darren Carter (Forest Green Rovers) wins a free kick. Foul by Keanu Marsh-Brown (Forest Green Rovers).